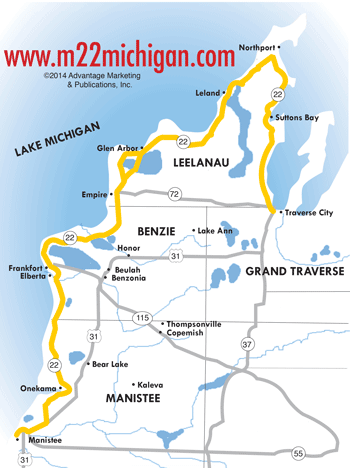 After winding through Manistee, Benzie and Leelanau Counties, your journey on M-22 ends as you enter Grand Traverse County and Traverse City, Michigan. Known as the "Cherry Capital of the World," Traverse City is one of America's Top 10 beach towns. Championship Golf Courses, world-class spas, pristine beaches and exquisite food make this the perfect ending to your M-22 journey. Read more about Traverse City here. 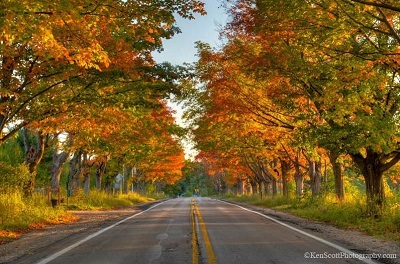 Grand Traverse County has the best of both worlds: the city life and the countryside. Extending north of Traverse City is Old Mission Peninsula, which splits the Grand Traverse Bay in two. Several wineries are along the M-37 highway to the Old Mission Lighthouse Park at the tip. South of Traverse City is the small town of Interlochen, home to the Interlochen Center for the Arts and venue for top performers from all over the world. The Grand Traverse county has great hiking and biking trails, including the 47-acre Traverse City State Park. In Williamsburg, east of Traverse City, check out the GT Butterfly House and Bug Zoo for family fun!